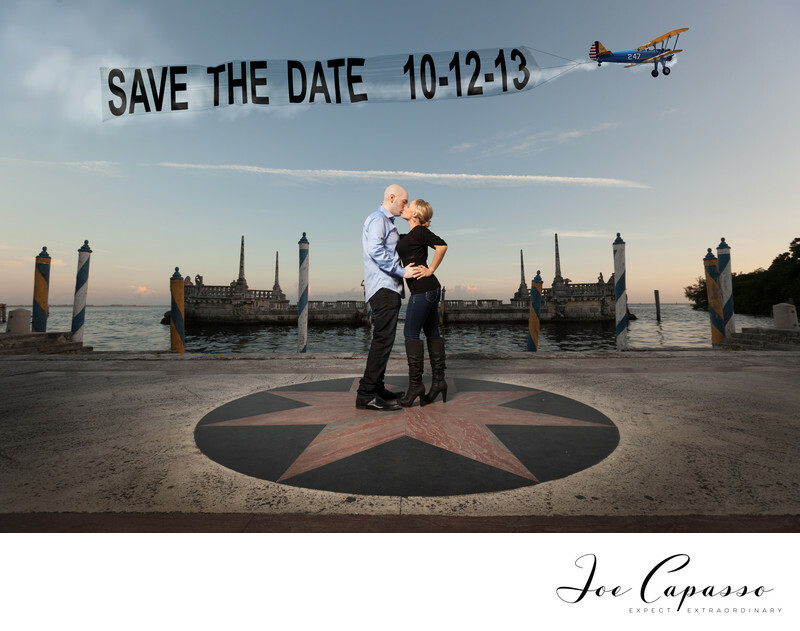 Joe Capasso is also a Miami Wedding Photographer. Here we photographed a couple's engagement session at Vizcaya. Vizcaya, now named the Vizcaya Museum and Gardens, is the former villa and estate of businessman James Deering. It sits on the Biscayne Bay in the Coconut Grove neighborhood of Miami, Florida. The early 20th century Vizcaya estate also includes: extensive Italian Renaissance gardens, woodland landscape, and a historic village outbuildings compound. Vizcaya was officially completed in 1923. The landscape and architecture were influenced by Veneto and Tuscan Italian Renaissance models and designed in the Mediterranean Revival architecture style, with Baroque elements. Paul Chalfin was the design director. Diego Suarez mostly designed the gardens that sit near the house using some of Chaflin's ideas. Miami-Dade County now owns the Vizcaya property and calls it the Vizcaya Museum and Gardens. Vizcaya is a a popular place for weddings and wedding photography. For an entry fee of around one hundred thirty dollars you can rent a permit to enter the Vizcaya with a photographer for an engagement session, or any kind of photo shoot. Weddings at Vizcaya require a more expensive license, but many couples enjoy the location because it doesn't resemble anything else in Miami. You feel like you're in Italy as you walk around the Miami wedding hot spot. Vizcaya wedding photographers love taking portraits on the property because everywhere you turn there is a beautiful location. It's easy to find beautiful natural light early in the day or later in the evening. Our couple pictured in this photo is Taryn and Josh. They wanted a photo for their save the date invitations that would stand out. Here we placed the couple in front of the conrete Vizcaya boat landing. This was photographed later in the evening in December. Since the sun sets earlier that time of year, we brought in a large softbox from the left. The banner plane was photo-shopped in later. We used plastic wrap tied around two light stands. I photographed the plastic wrap and plane separately. The smoke was drawn into the photograph with a pressure sensitive wacom tablet using a brush that resembles smoke. The plastic wrap was then inserted into the photo using a blending mode in Photoshop. We then added the couple's wedding date. They loved the photo, along with the rest of the images we captured during their Vizcaya engagement session. If you're planning a destination wedding in Miami, don't overlook Vizcaya! Keywords: miami (3), miami wedding photographer (12), miami weddings (3), vizcaya (3), vizcaya engagement session (3), vizcaya wedding (3). 1/200; f/5.6; ISO 200; 16.0 mm.